During Napoleons drive for Moscow, his army suffered heavily due to the lack of supplies that was the result of the long supply line, enemy cossacks and the famous Russian ‘SZcorched earth’ strategy. On the vast plains of Russia, a French force is sent to try and capture some much needed enemy supplies from a local warehouse. The Russian rearguard, however, is trying to evacuate the supplies towards their own warehouse. The French have the first turn. Both sides win when scoring 6 VPs. France is pennants, Russia is banners. A unit that is located on the warehouse hex is considered bold. The Warehouse blocks line of sight and a unit entering the hex must stop. The French rapidly advanced their right wing while the Russians hurried to carry some of the supplies to their lines. After a small while the Russians set ablaze the warehouse, covering the retreat of the supplies with their cavalry. The French troops assaulted the Russian right flank, but were to exhausted to press the advantage. The French artillery then started a cannonade of the Rusian center before the general advance was sounded. The Russians, however, were in excellent defensive positions and repulsed the initial attack. Under cover of night, the main Russian army escaped unharmed, leaving the French exhausted and without supplies on the field. The Building marked ‘A’ is actualy a warehouse that holds supplies that are vital to each army. The Russians start in possesion of the warehouse. Place 10 victory counters on the warehouse. At the end of his turn, a players that is in control of the warehouse may take 1 VP from the tower, change it in his color, and move it 1 hex towards his boardedge. Then, he may move all other Victory counters that he controls, 1 hex towards his board edge. If the counters are move off the board, they are put on the controlling players victory track. Victory counters represent supplies that will be moved by the army towards their own lines. 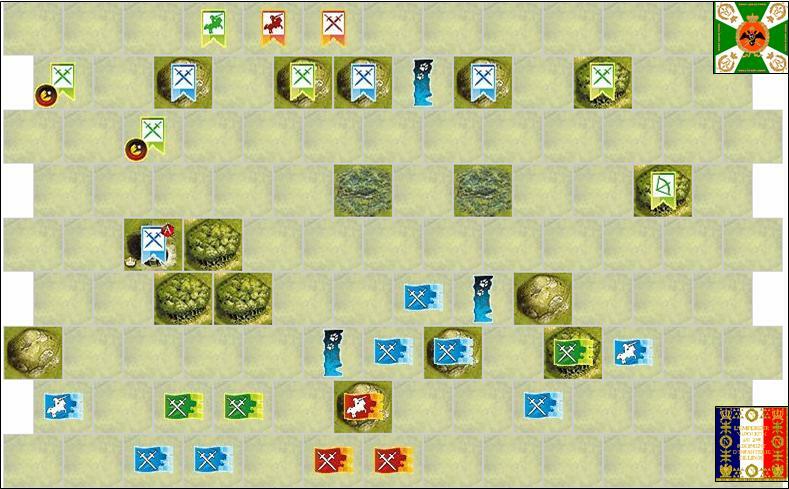 A victory counter may land in a hex that contains a unit. It does not move with the unit. There may only be 1 victory counter in a hex. If you caputre an enemy counter, it changes to your color and you may move it at the end of your turn. Capturing a victory counter is done by moving one of your units into a hex that has an enemy victory counter but no enemy unit to protect it. As long as the russian player is in control of the warehouse, he may elect to ‘set ablaze’ the warehouse. He does this by ordering the unit inside and moving it 1 hex next to the warehouse (he is not allowed to fight). Setting ablaze the warehouse will destroy any supplies there. Alle supplies that are already moving on the map will remain in play. Setting ablaze your own country is, however, not sucha nice thing to do, so the French get 1 VP if the Russian set ablaze the tower. Once set ablaze the tower is impassable and block LOS.The French may not set ablaze the warehouse.